1. To advance the education of Palestinian children. 3. To preserve and protect the health of Palestinian children and their families through the provision of financial assistance, support, education and practical advice. We are delighted to report that registration with the Charity Commission of England and Wales was achieved yesterday. 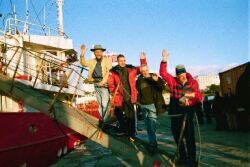 The other trustees are Susan Halpin, Yousef Zawahreh PhD materials scientist and John Hingley, trawler skipper and owner.